The daily deal is not so hot these days, something Groupon (s grpn) is well aware of. That’s why it continues to expand into new areas like products sales with Groupon Goods and merchant services with Groupon Payments and Rewards. The latest sign of its move away from daily deals is Groupon’s purchase Monday of discount restaurant reservation service Savored for an undisclosed sum. 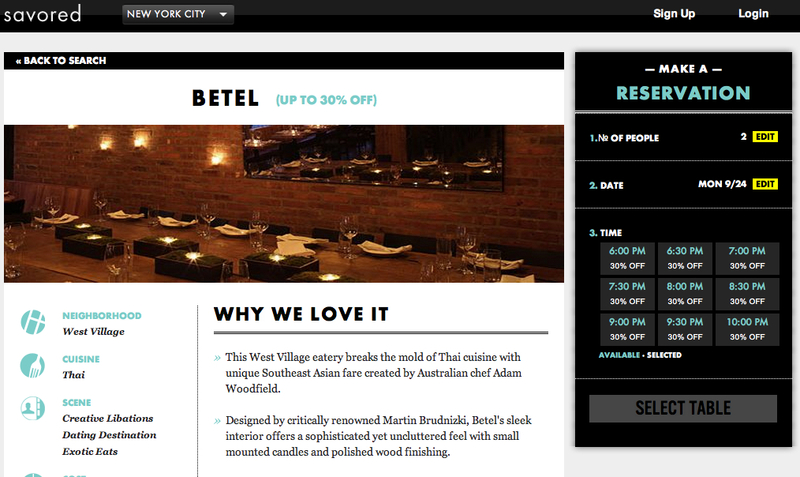 New York City-based Savored is structured quite differently than Groupon’s original product. Instead of getting merchants to offer a deep discount, with the proceeds split between Groupon and the business, Savored requires consumers to make a reservation at a nice restaurant at a specific time. When they secure a table, they get a discount usually between 30-40 percent off. Savored used to charge users a $10 fee to make the reservation but dropped that in May in favor of taking a small fee from the restaurants. Since the service began three years ago, more than a thousand generally higher-end restaurants have signed on to use Savored’s reservation system, which now operates in ten cities. Groupon said it will continue to operate Savored and will not close it as it has done with other acquisitions. Savored works as a yield management tool for restaurants and, as such, will work alongside Groupon Now, which also tries to help businesses sell unused inventory. The purchase is another indication of how Groupon is distancing itself from the daily deals market. Groupon, which helped popularize the daily deal, is experiencing slowing growth with its core product, with users spending less on the service. The big problem with daily deals is that merchants were giving up steep discounts and sending half of the revenue back to Groupon on the premise that Groupon users who were introduced to a business were likely to come back as regulars, something that doesn’t happen that often. Also, merchants were often seduced by the ability to get some of their Groupon payment up front, kind of like a payday loan, though some ended up going out of business when they couldn’t honor all of their Groupons. Savored is different in that it gives restaurants a better shot at driving traffic at needed times, without having to give up as much profit or risk being labeled as a desperate discounter. Savored’s Ben McKean co-founder and CEO said in a blog post that many restaurants increased their bottom line by 50 percent after joining Savored. I can’t say for certain but I’m not sure most Groupon restaurants can say the same. Generally speaking, daily deals can work for some verticals, but they aren’t effective for many merchants. The company’s real future is in selling discount goods through Groupon Goods and being what CEO Andrew Mason describes as an “operating system for local commerce.” Both of those businesses are still unproven and there’s no guarantee they will succeed. And even if they do, will likely offer much leaner margins than daily deals. Hi,I have a laser clinic I am appalled on the ammount of items that Groupon gets away with.In the US Groupon only sell deals on food or food related deals,but in any other country they are allowed to sell anything including:laser hair removal,microdermabrasion,botox,dentistry etc.Groupon never ask if companies aggreeing to these treatments have qualified staff or if they have any insurance or if they practise at the back of a van! In my clinic I see many clients who are receiving 3 types of laser treatments in 3 different clinics.I find this outrageous,I have sent an email to OFT with my concerns and I have also spoken Watchdog-nobody seems interested.I see many fungus infections from pedicures,I see very strange skin conditions in my opinion due to clinic items not been sterilised.Many of the companies are not even registered with their local council.They use this “cut throat” tecnique which is putting honest businesses out of business-and we wonder what`s happening to the high stree?Groupon is happening!Hey but what do I know?